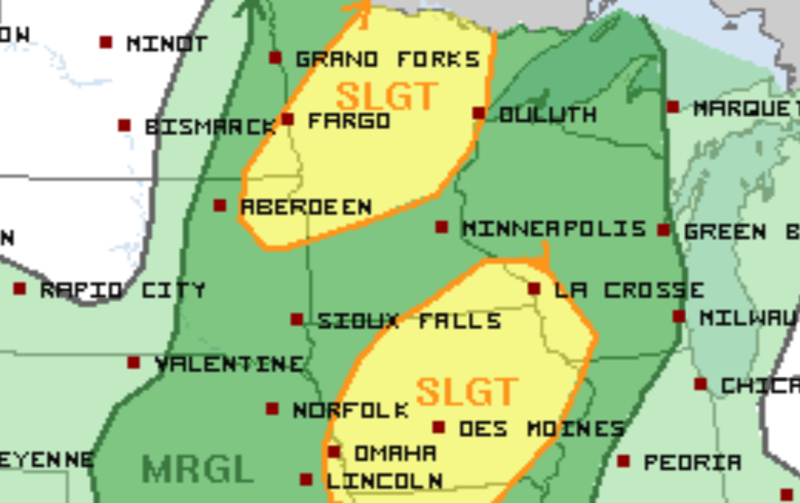 Lingering cloud cover has put a dent in the severe weather chances in Minnesota on Friday, but the severe threat still exists. According to the latest update from the Storm Prediction Center, the areas with the highest risk of severe storms are in central, northern and far southeast Minnesota. Those areas, shaded in yellow in the map below, are under a slight risk for severe storms. The Twin Cities, shaded in green, has just a marginal risk. Damaging winds and large hail are the main hazards with any storms that reach severe limits. Future simulated radar, while not exact, provides a good look at what could happen between 1 p.m. and midnight. The simulation below shows storms firing in northeast South Dakota around 3 p.m. and then forming a small line of storms that treks through central Minnesota through the evening and after dark. Friday is a big night for outdoor activities with the Minnesota State Fair and plenty of high school football games. Many schools decided to start their football games earlier to avoid potential weather hazards.